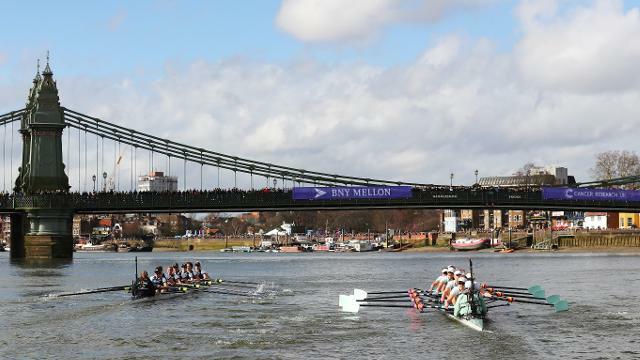 On Sunday 7th April 2019 men’s and women’s crews from Oxford and Cambridge universities will battle it out on the Thames during The BNY Mellon Boat Race and The Cancer Research UK Women’s Boat Race. Held annually, The Boat Race is a side-by-side rowing race along a 6.8km (4.2 mile) tidal stretch of the river Thames from Putney Bridge to Chiswick Bridge in south-west London. One of the biggest free sporting spectacles in London, The Boat Races create a festival atmosphere on the banks of the river Thames. Up to 250,000 people flock to the riverbanks every year to join in the celebrations and watch the Oxford University and Cambridge University Eights race along the famous 4.2-mile (6.8km) Championship Course between Putney and Mortlake. We can offer guided tours to suit groups visiting London for sports events. As professional London Blue Badge Tour Guides we lead guided tours around Queen Elizabeth Olympic Park, The All England Lawn Tennis Club, Wimbledon,Twickenham Stadium, London and the surrounding area. Private group bookings available. Contact us to see how we can help.